Built ca. 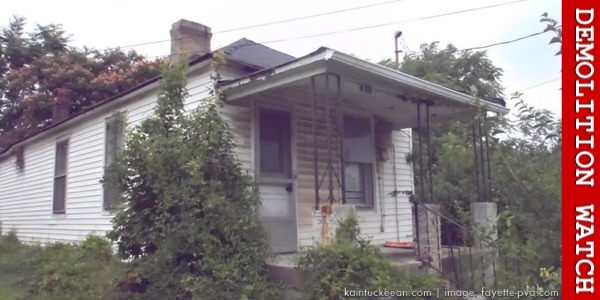 1920, 453 Speigle Street is yet another Lexington shotgun that recently faced her demise. A permit of demolition was issued on May 26, 2015. Although the PVA lists a private owner for the property, the demolition permit favored LFUCG Code Enforcement. News of this demolition was the first I had heard of this little little area known as Speigle Heights. As it turns out, I've walked through a small portion of it before unwittingly though I must not have taken note. 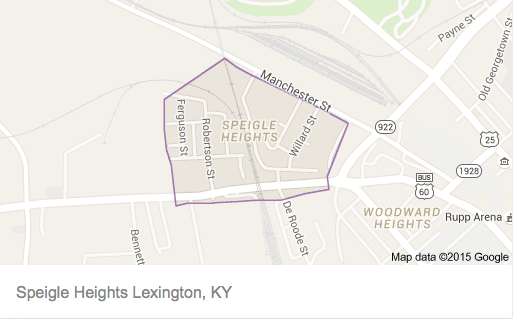 Speigle Heights was created from the subdivision of two parcels: Adcock Addition and Adcock Second Addition. The first included 108 lots that included parts of Jane, Robinson, Ferguson and Douglass streets; its plat was filed on July15,1912. I couldn't find information on Adcock Second, though 453 Speigle was located in this latter addition. The area west of the railroad tracks is only accessible via Robertson Street. The first reference to Speigle Heights in the local history index was specific to 453: Henry Berry passed away at his home here in January 1935. Mr. Berry, a member of the Main Street Baptist Church, was buried in the African Cemetery #2. According to the 1930 census, Mr. Berry had been a janitor at Transylvania College. The references to Speigle Heights, however, multiply through the years beginning in the 1990s, but most are crime-related. In July 1998, the Lexington Herald-Leader published an article entitled 'Invisible Heights' in which it was noted how "odd this week [it was] to see the name of Speigle Heights in the Sunday edition of The New York Times Magazine. . . . The Heights is a tiny, nearly invisible neighborhood in Lexington, a scattering of little houses on Speigle Hill that overlooks the railroad tracks below." The New York Times? Yessir. The NYT piece concerned Gayl Jones who, born in 1949, "grew up in a cramped, dilapidated house with no indoor toilet in Speigle Heights, one of Lexington's more turbulent black neighborhoods." Jones would become an accomplished author, but the NYT article concerned the gruesome events related to her mother's passing from cancer, accusations of medical experimentation, Jones' husband's suicide following a violent 1998 confrontation with Lexington police seeking to execute on a 1983 warrant from Michigan at the couple's north Lexington home. The full NYT account can be accessed here. I drove through parts of Speigle Heights yesterday and discovered an area containing a mix of older and more recently constructed lower income housing with a small community park. But clearly, there must have been something more to this neighborhood in the days that Mr. Berry lived in Speigle Heights. It was a place of pride to own a home in the predominately-African American Speigle Heights. As noted in the Herald-Leader in 2006, "Back in the day, some black folk in Lexington thought of the black people who lived in Speigle Hill as saditty (pronounced sa-dit-ty). Stuck up. Snobbish. But that was because the families who lived on the eight streets that constitute the Speigle Hill community off Versailles Road back then owned their homes, and they weren't the type to wait for things to be handed to them. The men by and large worked for the city in some capacity, including as police officers and firefighters."